Am I participating I far too many challenges? We’ll see…. The Hasenbach Challenge is hosted by Katrin in Germany. I have been watching this challenge for a couple of years now; this year, I’m in it. Der “Hasenbach Challenge” wird von Katrin geleitet. Ich habe diesen Challenge seit ein paar Jahren verfolgt – und dieses Jahr bin ich auch dabei. 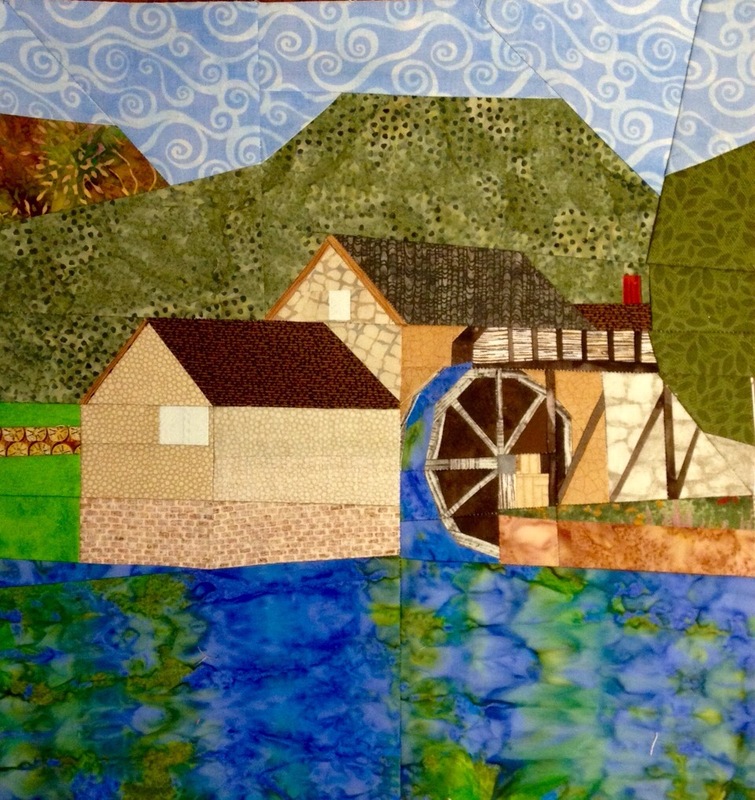 Every other month, a rather complex paper pieced block will be released. In the months in between, we will get the patterns for stars (to be placed in between the architectural blocks). 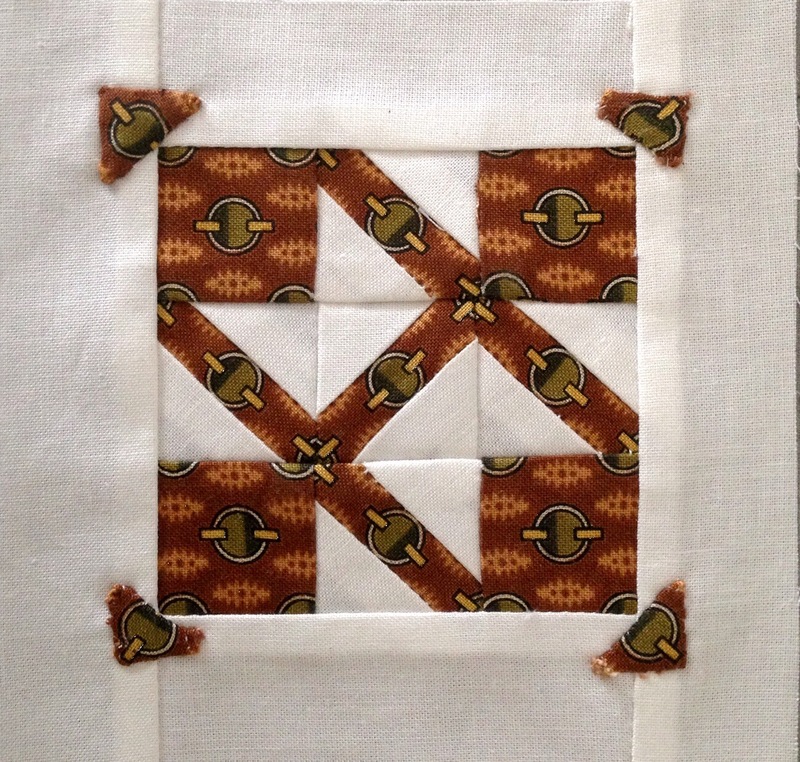 The sashing blocks, which feature simple pieced schoolhouses are available all year. Katrin wird abwechselnd einen Gebäude Block in einem Monat veröffentlichen, und im nächsten Monat zwei Sterne Blöcke. Die Sterne Blöcke werden zwischen die Gebäude eingenäht. Es gibt auch Sashing Streifen (mit Schulhäusern); die sind das ganze Jahr durch erhältlich. 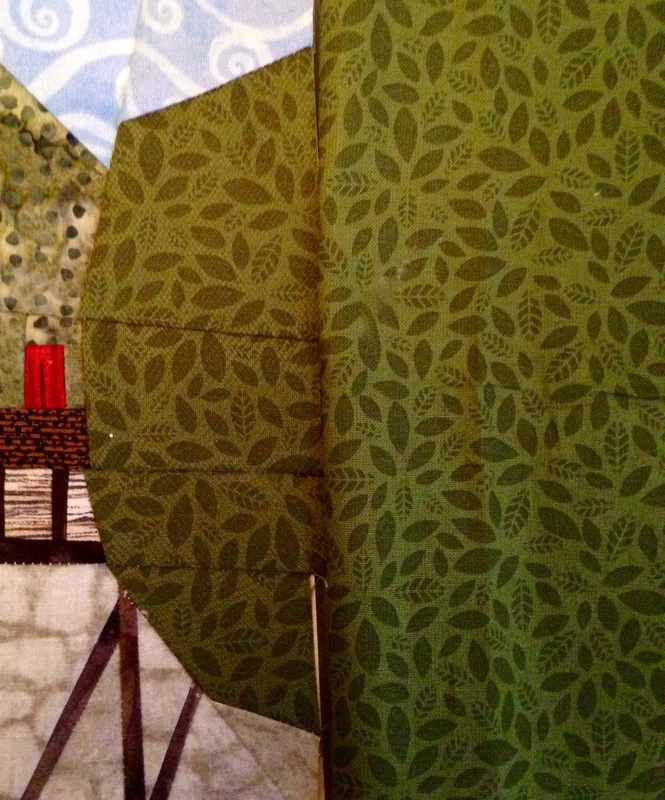 I am not a big friend of literal architectural fabrics (i.e. fabrics with waves for water, or fabrics with trees printed on them for woods) so I use them very sparingly. In the piece above, I used a very small brick pattern on one of the foundations. In order to evoke the look of aged brick I reversed the fabric – the side you see is actually the backside. The same is true for the house in the front. On the wall with the window in it, you see the right side of the fabric, where on the side the back of the fabric is facing out. I think doing this creates a bit more perspective, while evoking a feeling of “sameness”. Ich verwende Stoffe mit Architektur nicht zu oft (Stoffe die Wellen drauf gedruckt haben für Wasser oder Stoffe die Bäume drauf haben für Wald). In diesem Block habe ich einen Stoff mit sehr kleinen Ziegelsteinen verwendet. Weil die Farben aber zu grell waren, habe ich den Stoff umgedreht (was man hier sieht ist die Hinterseite). Ich habe dasselbe für die Hauswände getan: die Wand mit dem Fenster ist der Stoff mit der rechten Seite sichtbar, und die andere Wand ist derselbe Stoff mit der hinteren Seite sichtbar. Einerseits denke ich die Perspektive ist so besser, andererseits sieht das aber wie dieselbe Wand aus. On the tree on the right side I used a green fabric that I really like, but it appeared a bit too bright for me. So I toned it down a but by laying a piece of brown tulle over it. I do this while assembling the pieces, and so the tulle is sewn into the piece. The effect is toned down color and a more three-dimensional look. Der dunkel grüne Stoff (Baum rechts) gefällt mir sehr, aber das Grün war ein wenig zu stark. Ich habe hier ein Stück braunes Tüll darüber gelegt (Ich nähe das Tüll und den Stoff als ein Stück). Der Endeffekt is ein abgeschwächtes Grün and mehr Dimension. There are also two errors in the block: the grey roof is one of them. While I really like the chosen fabric, I think the orientation is wrong; had I angled the fabric, it would have given a more realistic look. Not some thing I can correct now (unless I take the whole thing apart) so I will try to fix it with the quilting. Also, and more importantly, somehow I missed one of the vertical wooden supports on the right hand side. This one can and will be fixed by appliqueing the support onto the block. Ich habe auch zwei Fehler gemacht 😦 – das graue Dach ist der erste davon. Das Muster ist fürs Dach sehr geeignet aber die Orientierung stimmt nicht. Hätte ich den Stoff auf der Schräge genommen, würde das ganze besser aussehen. Dies ist nicht etwas das ich jetzt korrigieren kann, also bleibt es halt so….vielleicht sieht es nach dem Quilten dann besser aus. Der zweite Fehler kann korrigiert werden. Irgendwie habe ich den einen Träger der Wassermühle verpasst. Ich werden ihn auf den Block applizieren. There is also a bush (appliqué) and a flowering vine (stitched on) in the pattern – I have decided to hold off on those until later in the challenge as I want to use some of those elements to unify the different blocks. Es gibt auch einen grünen Busch (Applikation) und eine Blumenpflanze (Stickerei) – ich habe beschlossen zu warten bis ich die nächsten paar Blöcke gesehen habe. Ich werde versuchen mit diesen Elementen die Blöcke zu vereinheitlichen. Kate is the young lady that takes care of our dogs when we are out of town. We have three Shih Tzu girls that Charlie calls his babies. Most of the time, they follow him around like if he is the pied piper. Kate is 20 or 21 (I think) and in college. She lives at home, directly across the street from us, and is an all around nice young lady and, she takes great care of the girls when we are gone! 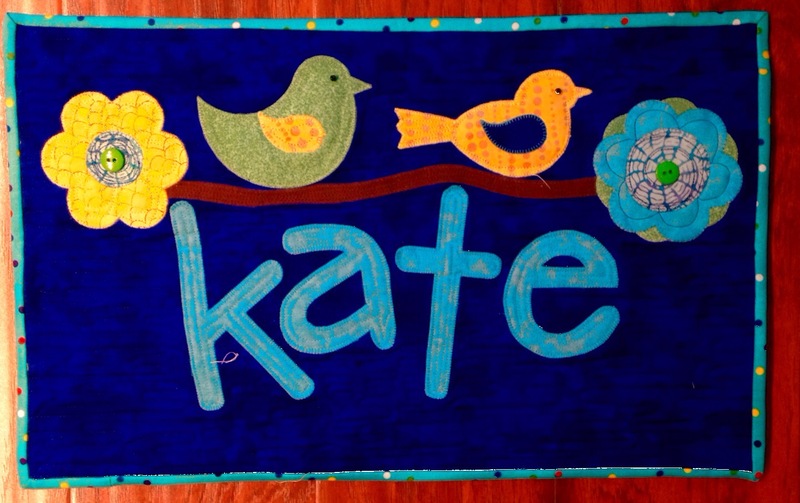 Having won an Accuquilt baby and a couple of dies recently, I decided to make a sign for Kate. Her favorite color is blue, so I use a vibrant royal blue as the background. I appliquéd her name in teal (utilizing applique knowledge acquired in a recent class) under a free form tree branch. At either end of the tree branch are two die cut flowers and sitting on the branch are two die cut birds. To give the whole thing a bit more dimension, I added applique circles and green buttons to the center of the flowers. The birds got wings and little beads for eyes. The binding is a teal polka dot print. I am pretty sure that Kate does not follow my blog; if she does, the surprise is definitely spoiled! As with every block, there are several ways to complete this one…I considered several, but decided that the following was the best option. 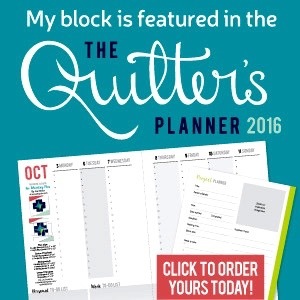 I saw this method on “thatquilt.com”, a blog that includes instructions to all the blocks of Dear Jane. 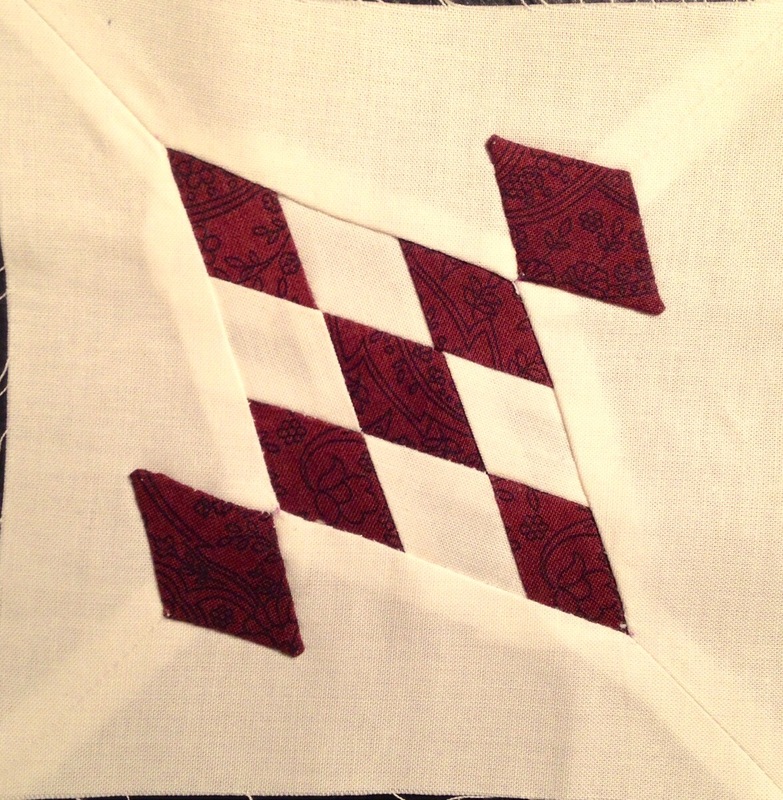 This block included appliquéing the four shapes onto the background fabric and then add inn the four paper pieced corners to that center. Block 159 has 21 pieces. It took me a few days to complete this block! 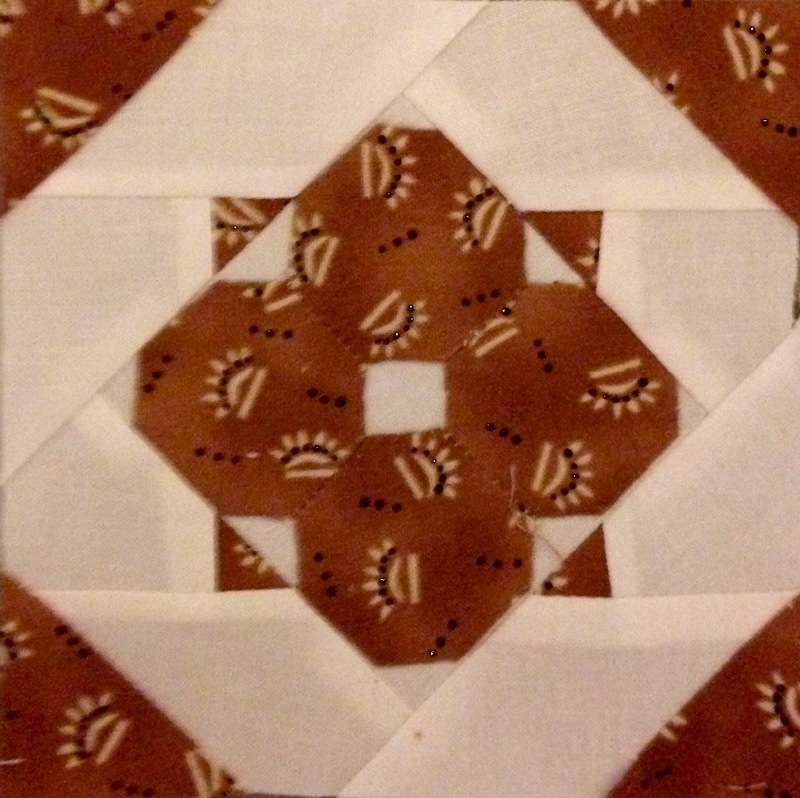 I made the center (diamonds), paper piecing it, and then thought I’d add the sides using inset seams. that did not look good at all! 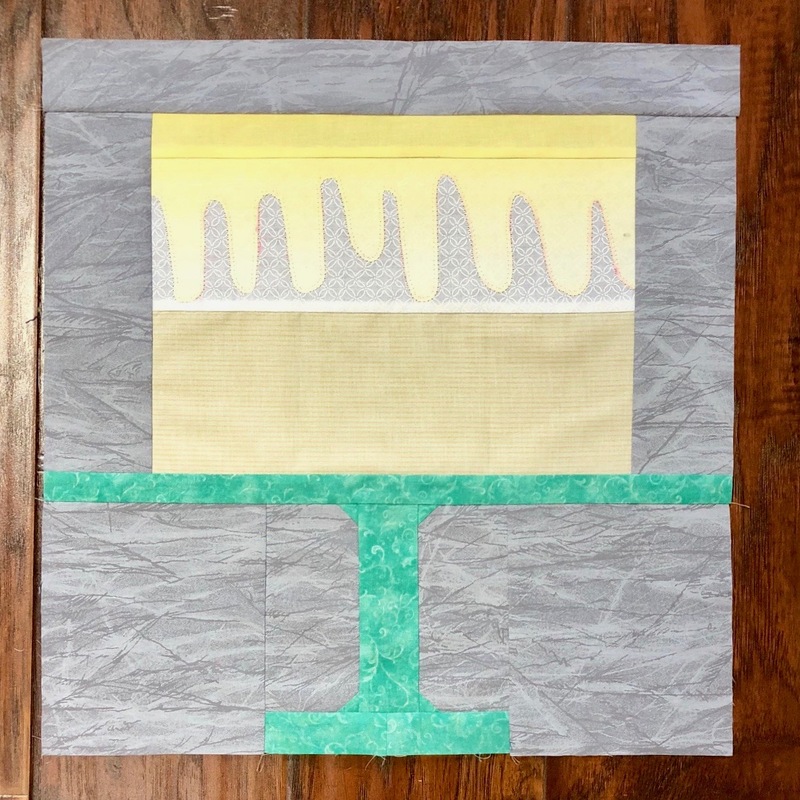 I took it all apart and started over…..I made a square out of four quarter square triangles in order to create the seams shown in the block. Then I added the center section using reverse appliqué. 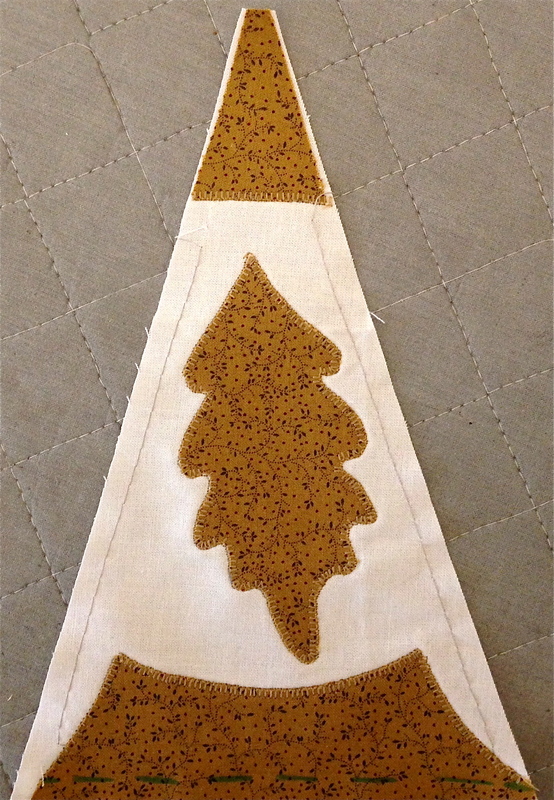 When that was completed I added the larger diamonds (needle turn appliqué). 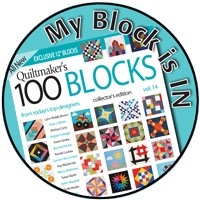 This block more than any other (that I can recall 158 blocks in) embodies many techniques…. This is block # 158 incorporating 15 pieces. I like this block! (If I may say so myself)…. I wasn’t at all sure this was going to work; the pattern on the fabric is a bit large for this block (so I thought). But it turns out, Once I picked out certain elements that fit into the different sections, and then fussy cut them into these sections, it all comes together into a cohesive design! This is block # 154; it has 17 pieces. I think I will re-name this quilt “Fussy Jane” since I have gotten bitten by the “fussy cutting” bug. 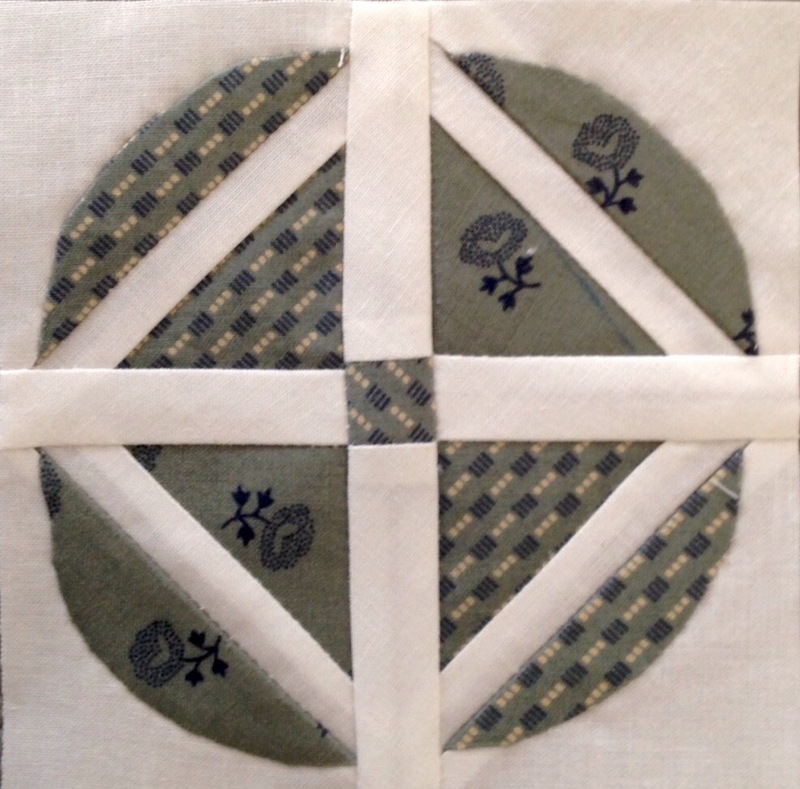 For my non-quilting relatives, “fussy cutting” is the targeted cutting of fabric to highlight a particular design/motif on the fabric (rather than randomly cutting it)…in this block for example, I cut the fabric so that the circles were running in the same direction. The triangle shapes are a little less than perfect (understatement! ); the plan is to either fix them later or re-do them altogether…. This is block # 151. It has 27 pieces. 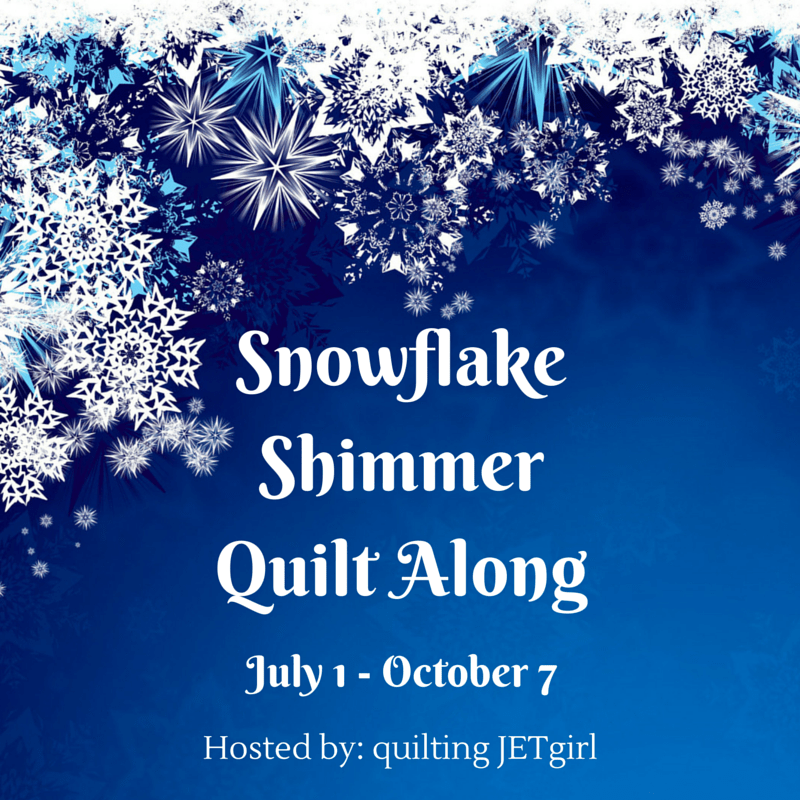 During the time that I have been working on this quilt, my skills have evolved – a lot more than I realized. When I look at the blocks I made when I first started, and the ones I have completed recently, there is a marked difference in the quality of my work. Having said that, I also came to the conclusion that this quilt might also be a compilation of all the techniques I have attempted so far (in this or any other quilt). That’s why I will make a few (very few) machine appliquéd blocks. This one is one of them, and it lend itself beautifully to it! This is block # 150 and it has 4 (!!!) pieces. As many of the other blocks, the hardest part was figuring out how to make this block. 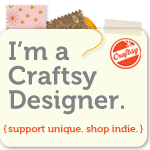 Intuitively, I want to start with the most dominant fabric in the block and piece/applique/paper piece from there. Sometimes this is not the best or easiest approach – sometimes starting with the least dominant fabric reveals an easier method….. 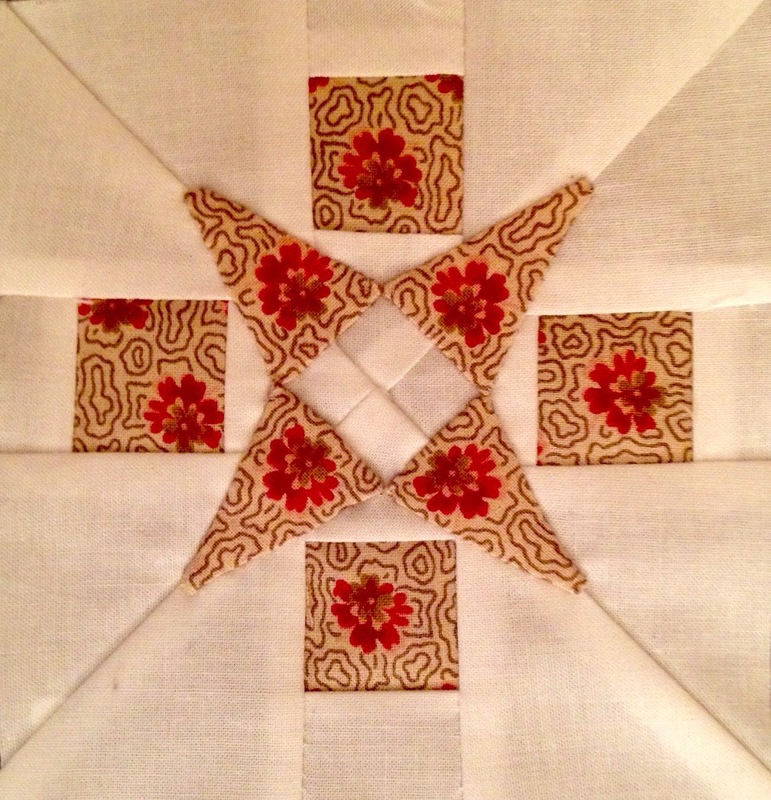 I dissected this block into four quadrants, pieced them individually and then sewed them together into a square. 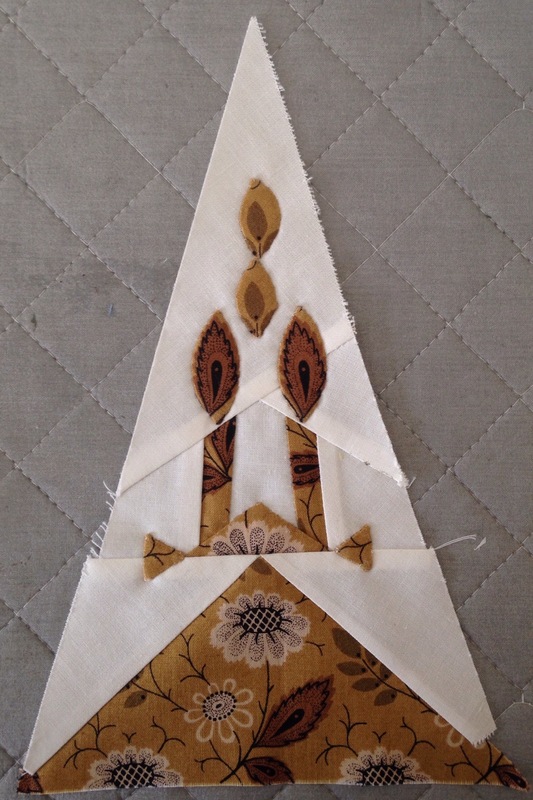 Then, I appliquéd the four triangles. 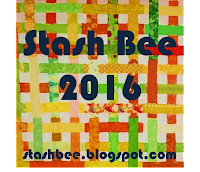 In a familiar trend, I had picked a fabric with an overall pattern, a non directional. I pieced the first quadrant, looked at it and decided to fussy cut the flowers into this block. I left the first quadrant as it was because I like the visible contrast between the fussy cut sections and the randomly pieced one….. This is block # 149; it consists of 24 pieces.